Looking for a finger licking good recipe for an appetizer or finger food, then you have got to try these Stuffed Jalapenos With Crispy Bacon. They are easy to make and a low cost recipe as well. Best part is you can prep them BEFORE your guests show up, then pop them in the oven right before they arrive for a hot and tasty treat with no stress. Wash peppers, then cut in half lengthwise and take out seeds and ribs. You might want to wear gloves while you do this, or put oil on your hands, then wash them with soap after your done. I found using a small spoon or even a grapefruit spoon works really well for getting the ribs and seeds out. You want to make sure you get all the seeds out because that is where the heat is, if you like spicy then keep the ribs in. In a mixing bowl add the cream cheese, shredded cheese and ranch seasoning. Mix well and spoon into jalapeno halves, place cooked bacon on top. Put on baking sheet, and cook in the oven at 400 degrees for 15 minutes. Quick tip *** I found that if you put them on a metal baking rack the peppers will stay upright during the cooking process and not tip over. When they tip over the cheese tends to slide out, so this helps prevent that. Make sure you put the rack on top of a cookie sheet for easier transport and clean up. Next articleFloral Wide Leg Lounger Pants for $12.99 (was $35.99) 3 days only. Amy Norma omg!! I’m totally making these!! Yum babe!! Take one for the team!!! Josh Guel are these what you were talking about? Thank you, we sure love this recipe! I love any kind of Stuffed Jalapeno! Diane, James still thinks about the ones you made!!! Thank you, we sure love them! These look delicious! I love bacon. WOW! 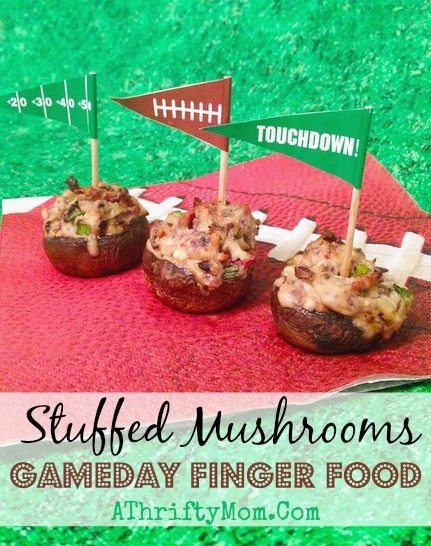 These look like good game day food! I have made these before, if you scrape out the veins they aren’t even spicy! my hubby cant even handle mild taco sauce at taco bell.. and these have less heat.. and he eats them.. its the seeds that make it hot.. take all of those out..